This medieval castle was built in the 11th, 13th and 15th century by the Lords of Vaudémont and Sires of Neufchâtel-Bourgogne. It is classified as an historic building.. Guided visits each day of the week from July 1st to September at 15.00, 16.00 and 17.00. Visits at the same time during the rest of the year but only on Saturdays, Sundays and bank holidays. Built by the end of the 16th Century, it was classified as an historical building in 1928 and was refurbished in 1982 as it is the 300th anniversary of Claude Gellée's death. A selection of paintings, sculptures, art pieces, local artists paintings are on display. Open from April 1st to October 30th on Wednesdays, Saturdays, Sundays and bank holidays from 14.30 to 18.30. The Village of Chamagne in located 20 km Northern of Thaon. Follow signs for Nancy (N57 dual carriageway) and then exit at Charmes junction. 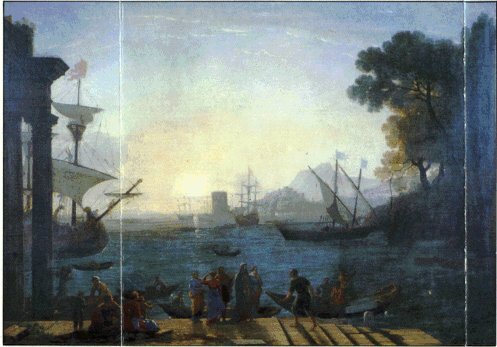 L'embarquement de Sainte-Paule à Ostie, Musée Départemental, 1650. Closed on Tuesdays and January 1st, May 1st, November 1st and December 25th. Follow signs for Vittel, Neufchâteau.